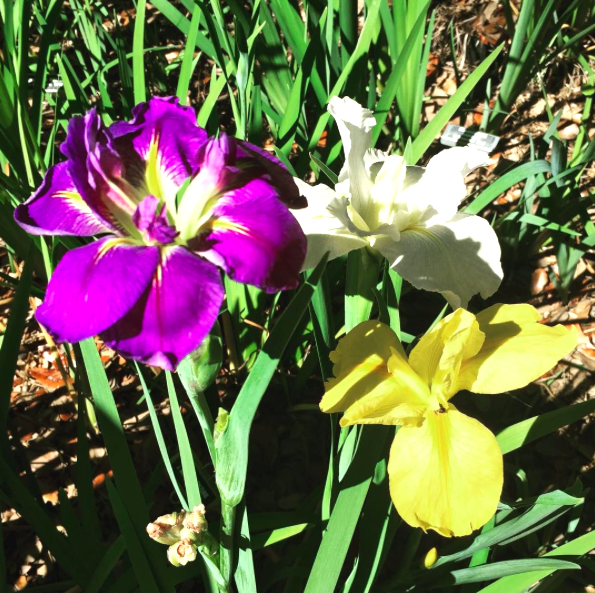 Louisiana irises bloom in a variety of colors. Professional horticulturists and amateur gardeners alike will gather in the Syndey and Walda Besthoff Sculpture Garden on Sunday, April 9, to share knowledge and admire the bounty of native Louisiana irises that thrive in NOMA’s “backyard.” A dedicated cadre of volunteers keep the gardens in pristine condition throughout the year, chief among them members of the Greater New Orleans Iris Society, cosponsors of the Louisiana Rainbow Iris Festival — so named due to the wide range of colors evident in the blooms. 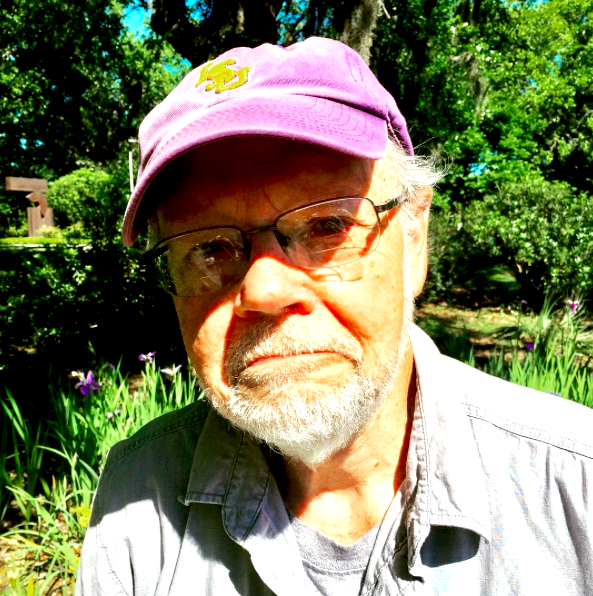 Patrick O’Connor, a member of the society and a former owner of a commercial nursery, spoke to Arts Quarterly about these beautiful — and endangered — plants. What type of irises grow in the Sculpture Garden? The irises originally planted in the Sculpture Garden were not a native species. When the Sculpture Garden was created, the landscapers planted a European iris, but Hurricane Katrina destroyed them all. After Katrina, the whole park was looking for plant material. [The Greater New Orleans Iris Society] has friends who are in the iris business, who have several nurseries, one in Schriever, one in Mooringsport, who have acres of irises. They were happy to donate irises. They brought in several pickup truck loads of these cultivars and we planted several beds, and then some around the edges of the lagoon. They were just magnificent, and so the sculpture garden became interested in having more and having them kept up and Mr. [Syndey] Besthoff liked them, too. We’ve been working on maintaining these Louisiana irises ever since. We’re having a joint convention of the American Iris Society and the Society for Louisiana Irises in 2018. Several irises have been contributed by hybridizers as examples of their latest irises. The people who come to the convention will look and those and vote on which ones they like. This is all a volunteer effort? Oh, yes. The Greater New Orleans Iris Society has 50 or so members. We usually come out to the Sculpture Garden once a month to work. We have other projects. We have planting area in City Park where we are allowed to grow these native species and cultivars so that when they increase we can donate them to other gardens in Louisiana. The original planting of that European iris is a very aggressive iris. While Katrina nearly killed it, there were little remnants that were left in the ground and they will still come up occasionally. When we see that, we dig it out. If it were allowed to continue growing, it would take over. You can tell that one because it has, the blade has a mid-rib in it, whereas the Louisiana irises have a flat blade. If someone wants to plant Louisiana irises, what advice would you give? They’re not hard to grow, but Louisiana irises have some preferences. One, they like water. You cannot over-water them. The species are natives to wetlands and the cultivars will grow in normal soil, but they don’t want to dry out, so you have to keep them wet. I think the other thing that many people who plant them don’t realize is that they are heavy feeders. They like to be fertilized. If people don’t get good bloom, it is usually because they don’t have enough water or enough fertilizer, or they are planted in too much shade, particularly if they are around trees and the tree roots are taking the water. They like at least a half a day of sun. You give them that, and the wet conditions and a little fertilizer, they’ll bloom very well. 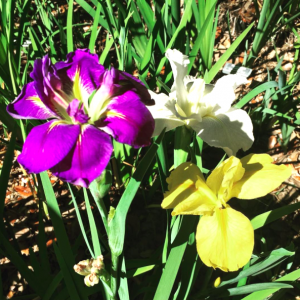 How did you develop an interest in Louisiana irises? I’m originally from Arkansas and when I moved here, I bought a house, and in the yard one of the native species was growing. It was one called Iris fulva, which happens to be a red species, and I had never seen a red iris. I thought that I had a rare plant, but I didn’t really know what it was and so I began to look into it and discovered this whole group of plants. It turned out the fulva is not that rare. If you go out in the roadsides in south Louisiana, and even up into the north, you can find it in wet ditches and so forth. It’s a beautiful iris. That was what got me started, seeing one of the native species. In general, they are an endangered plant in many areas. Natives used to be all over New Orleans. There were just masses of them in the East, out in the wetlands. Along the Bayou Metairie, too, the red fulva grew there. Where the bayou ran into the wetlands, you would get natural hybrids between the blue ones and red ones. New Orleans used to be sort of the epicenter of wild irises but, in the city, they’re mostly all gone to development. Our organization is really committed to helping preserve them.